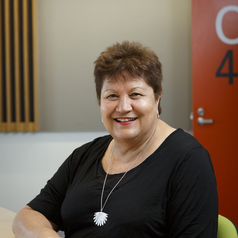 Liz McKinley is currently Professor Indigenous Education in the Melbourne Graduate School of Education (MGSE) at the University of Melbourne. She has a background in secondary teaching, teacher education and leadership roles in Māori education. During her term at Auckland she was a Professor in Māori (Indigenous) Education at the University of Auckland, and the director for eight years of The Starpath Project for Tertiary Participation and Success. This project focused on students from schools that serve our low socio-economic communities, particularly Maori and Pacific Island students, in Auckland and Northland. Professor McKinley also brings experience in research relating to curriculum, school wide change, and higher education in the context of Māori education. Professor McKinley was a member of the Minister of Education’s (NZ) Ministerial Cross Sector Forum (MCSF) on Raising Achievement (2012-2014) with the purpose of advising the Minister of Education on matters of policy, chairing the Benchmarks for Progress, advising the Deputy Secretary of Evidence, Data and Knowledge on metrics, data collection and dissemination of data to stakeholders. She advises various NZ government agencies on education.